Even though the Thrift is down to about 35% Martin says the fishing has been unbelievable. Remember that at 35% it will still you take about an hour and a half to walk around this very big stillwater. A team of 3 anglers caught 50 rainbows in 2 days averaging about 3 to 3,5lb with the biggest at 7lb. At one stage a gale force wind came up, but the 3 of them stuck in their kickboats and using a dapping technique downwind with large dries caught 10 large fish which made for very exciting sport. Another interesting observation made by these anglers was that they were catching 200g fish which were stocked in December at half gram size which is phenomenal growth. At Redcliffe nobody has fished for several weeks but all their dams are full and well stocked. The Queenstown Fly Fishers Club chairman, Reg Morgan (082 7033489 & 045-8381854) reports that they could certainly do with some good rain, but their dams are fishing extremely well. 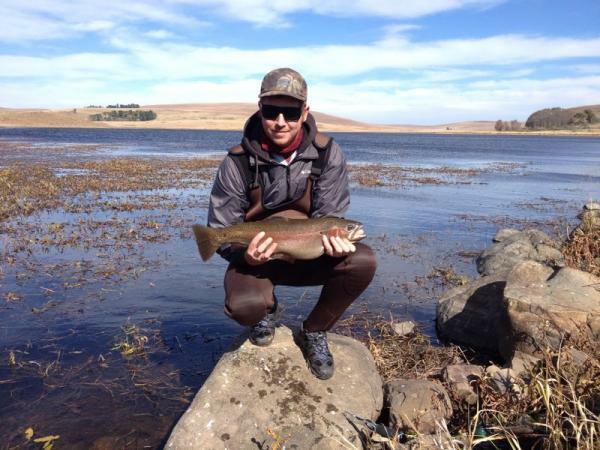 Uncle George’s Dam is one of the full dams and has produced excellent fish despite the heavy week growth. Pine Grove also is producing well. Even though it is quite low it has been enlarged and still has plenty of water. Birds River dams are concerning as they are at a low level but they still fish well. The date for the annual Gathering for 2019 has been set for 3 to 5 July and so far 20 anglers have booked including a team from the Western Cape and more participants are expected. The club website is at http://www.qffc.co.za/. Alan Hobson reports that the town council have decided to use Bestershoek for the supply of water to the municipality so this nearby dam will no longer be stocked. The drought has probably killed most of the trout in the upper Little Fish which is no flowing and has had a serious effect on the Swaershoek and Cradock waters. On the other hand Mountain Dam continues to fish well with some really good fish coming out. The Naudes River up in the waterfall area plus Mill Dam at Glen Avon are also very fishable and the yellowfishing in the Little Fish below the town continues through the winter so there is still plenty on offer. In addition the Bankberg Club are looking at developing the 3 Shelton dams which are situated on the Bosberg on the road to Mountain Dam. A couple of these dams do hold some trout. Alan may be contacted at 042-2433440 or 0824422884.